The cover of the first volume as published in Japan. Attack on Titan: No Regrets (Japanese: 進撃の巨人 悔いなき選択, Hepburn: Shingeki no Kyojin Kui Naki Sentaku) is a Japanese manga series written by Gun Snark and illustrated by Hikaru Suruga, based on a visual novel of the same name. The series is a spinoff of Hajime Isayama's popular Attack on Titan (進撃の巨人, Shingeki no Kyojin) manga. The story follows Levi Ackerman before he joins the Survey Corps. The series is published by Kodansha in Japan and by Kodansha Comics in the United States. A two part OVA was released in 2014 and 2015. The series is written by Gun Snark and illustrated by Hikaru Suruga (駿河ヒカル, Suruga Hikaru). A prologue chapter was published in the November 2013 issue of Kodansha's shōjo manga magazine Aria on September 28, 2013. The prologue was republished in the December issue on October 28, 2013 after the first issue to contain it quickly sold out. The series regular began in the January 2014 issue on November 28, 2013. Kodansha made the decision to increase the magazine's print run 5-fold (500%) due to the series' popularity, starting with the January 2014 issue. When they reprinted the issue on December 16, 2013, they increased the number of copies again, making the total print run a 10-fold (1000%) increase over the previously recorded monthly sales of 13,667 copies. A special chapter was published in the May 2014 issue of Kodansha's Monthly Shōnen Sirius magazine on March 25, 2014. The series ended in the August 2014 issue on June 28, 2014. After the first volume was released, the decision to reprint it came on the same day. A booklet containing a set of character sketches and the prologue chapter was bundled with a special edition of the volume. Kodansha Comics announced their license to the series at their New York Comic Con panel on October 11, 2013. A two-episode anime OVA adaptation was announced in the 14th volume of Attack on Titan. The OVAs were produced by the same staff that produced the Attack on Titan television series. The episodes were directed by Tetsurō Araki and written by Yasuko Kobayashi, with animation by Wit Studio. Character designs were provided by Kyoji Asano. The insert song is "So ist es immer" (Just Like it Always is) by Hiroyuki Sawano. The OVAs starred Hiroshi Kamiya as Levi, Daisuke Ono as Erwin, Kōji Yusa as Furlan, and Mariya Ise as Isabel. The first episode was included with the 15th volume of Attack on Titan on December 9, 2014, and the second episode was included with the 16th volume on April 9, 2015. On January 15, 2016, Kodansha Comics announced that they would release the two episodes with the special editions of the 18th and 19th volumes of the manga, on April 5, 2016 and August 2, 2016, respectively. Several years ago, in an Underground District where citizens rarely get to venture into the sunlight, Levi was part of a band of thieves alongside his partner Furlan Church, who would use maneuver gear to commit various heists to help each other out. One day, they meet a girl named Isabel Magnolia, who was chased after by guards for trying to get an injured bird back to the surface, and decide to take her in as one of their group. After a while has passed, a mysterious man from the surface uses a hostage to ensure Levi, Furlan, and Isabel take on a job that would be rewarded with citizenship on the surface. When the three take on the job, they outrun the military police but are arrested by the Survey Corps, led by Erwin, who offers to clear Levi and the others of their crimes in exchange for joining the Survey Corps. Information Available for Public Disclosure: The Underground City. 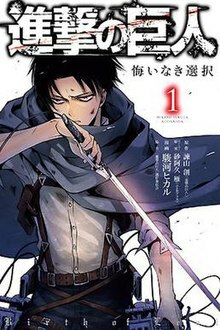 Levi, Furlan, and Isabel begin their lives in the Survey Corps under the watch of Flagen, who is less than pleased about being joined by criminals, all while recalling the mysterious man's request to kill Erwin and steal one of his documents. Unable to find the document in Erwin's office, the group come up with a plan to ambush Erwin during an expedition, which Levi initially plans to do by himself but is inevitably convinced by Furlan and Isabel to let them come with him. On the day of the expedition, the Survey Corps encounter a group of Titans, which Levi's group manage to help eliminate only to be scolded by Erwin for wasting gas. Later, Levi decides to make use of a heavy rainfall to get close to Erwin, but when he returns, he discovers Titans had ambushed and killed the rest of his squad, including Furlan and Isabel. After learning that Erwin was carrying a fake document the entire time and his mission was meaningless, Levi, taught not to have regrets, decides to continue following Erwin as a Survey Corps member. Information Available for Public Disclosure: Scouting Missions. The manga has over 1.5 million copies in print in Japan. The first volume of the manga had 500,000 copies in print as of April 2014, having sold 140,186 copies within the first five days of its release. The volume was also the 57th best-selling manga volume in Japan in 2014. The first volume of the English translation appeared on the New York Times Manga Best Sellers list for 18 nonconsecutive weeks, while the second volume was on the list for 12 weeks. Reviewing the first volume for The Fandom Post, Kate O’Neil gave it a grade of B. Noting Levi's status as a fan-favorite character, she wrote: "I often wonder at how much of the backstory in these spinoffs was the result of the original author’s notes or the spinoff writer responding to the desires of the fanbase." She also commented that the art is "handled by someone other than Hajime Isayama, which means that characters are actually well proportioned and the perspective is solid." She was mildly critical of the series' plot, saying that the "motivation of the players is shaky", and criticized the "simplicity" of the backstory. ^ The prologue chapter was not included in the original Japanese edition of the manga, and was instead published in a booklet that was released with a special edition of the first volume. It was, however, included in the English release by Kodansha USA. Vol. 1 (ch. 1–4): Suruga, Hikaru; Snark, Gun (2014). Attack on Titan: No Regrets 1. Kodansha Comics. ISBN 978-1-61262-941-4. Vol. 2 (ch. 5–8): Suruga, Hikaru; Snark, Gun (2014). Attack on Titan: No Regrets 2. Kodansha Comics. ISBN 978-1-61262-943-8. ^ "Attack on Titan: No Regrets Vol. 1". ComiXology. Retrieved May 31, 2018. ^ "Attack on Titan Blu-rays Add Visual Novels by Nitro+ Staff". Anime News Network. May 18, 2013. Retrieved March 11, 2016. ^ "Attack on Titan Spinoff Manga to Run in Aria Shōjo Magazine". Anime News Network. August 27, 2013. Retrieved March 10, 2016. ^ a b "K: Days of Blue Spinoff Manga Launches Next Month". Anime News Network. October 2, 2013. Retrieved March 10, 2016. ^ "Aria Reprints Attack on Titan Shōjo Prologue After It Sells Out". Anime News Network. October 8, 2013. Retrieved March 10, 2016. ^ "Attack on Titan Spinoff Causes Magazine's Print Run to Jump 500%". Anime News Network. November 11, 2013. Retrieved March 11, 2016. ^ "Attack on Titan Spinoff Causes Magazine's Print Run to Increase 10-Fold". Anime News Network. December 10, 2013. Retrieved March 11, 2016. ^ "3 Attack on Titan Spin-Off Manga Series Get Special Chapters in Sirius". Anime News Network. February 26, 2014. Retrieved March 11, 2016. ^ "Attack on Titan: No Regrets Manga to End Next Month". Anime News Network. May 27, 2014. Retrieved March 11, 2016. ^ a b "Attack on Titan: No Regrets #1 Has 500,000 Copies in Print". Anime News Network. April 20, 2014. Retrieved March 11, 2016. ^ a b 進撃の巨人リヴァイ外伝1巻本日発売、小冊子付き特装版も [Attack on Titan Levi side story volume 1 released today, includes special edition with booklet]. Natalie. April 9, 2014. Retrieved April 20, 2016. ^ "Kodansha Comics Adds Attack on Titan: Before the Fall, No Regrets Spinoff Manga". Anime News Network. October 11, 2016. Retrieved March 10, 2016. ^ 進撃の巨人　悔いなき選択（１） [Attack on Titan: No Regrets (1)]. Kodansha (in Japanese). Retrieved March 11, 2016. ^ 進撃の巨人　悔いなき選択（１）特装版 [Attack on Titan: No Regrets (1) Special Edition]. Kodansha (in Japanese). Retrieved March 11, 2016. ^ "Attack on Titan: No Regrets 1". Penguin Random House. Retrieved March 11, 2016. ^ "Attack on Titan: No Regrets 1". Amazon.com. Retrieved April 26, 2016. ^ 進撃の巨人　悔いなき選択（２）＜完＞ [Attack on Titan: No Regrets (1) (end)]. Kodansha (in Japanese). Retrieved March 11, 2016. ^ 進撃の巨人　悔いなき選択（２）特装版＜完＞ [Attack on Titan: No Regrets (1) Special Edition (end)]. Kodansha (in Japanese). Retrieved March 11, 2016. ^ "Attack on Titan: No Regrets 2". Penguin Random House. Retrieved March 11, 2016. ^ a b c d e "Attack on Titan: No Regrets Spinoff Gets Anime DVDs". Anime News Network. August 5, 2014. Retrieved March 11, 2016. ^ "Hiroyuki Sawano Performs Attack on Titan Film's Ending Theme 'YAMANAIAME'". Anime News Network. October 31, 2014. Retrieved March 11, 2016. ^ "Attack on Titan: No Regrets Anime's Promo Previews 1st Episode". Anime News Network. September 12, 2014. Retrieved March 11, 2016. ^ "Kodansha USA to Release Attack on Titan: No Regrets Anime DVD With Manga". Anime News Network. January 15, 2016. Retrieved March 11, 2016. ^ "Attack on Titan 18 Special Edition w/DVD". Penguin Random House. Retrieved March 11, 2016. ^ "Attack on Titan 19 Special Edition w/DVD". Penguin Random House. Retrieved March 11, 2016. ^ ＤＶＤ付き　進撃の巨人（１５）限定版 [Attack on Titan (15) Limited Edition with DVD]. Kodansha. Retrieved April 19, 2016. ^ "Attack on Titan 18 Special Edition w/DVD". Penguin Random House. Retrieved April 19, 2016. ^ Hajime Isayama (2016). Attack on Titan Vol.18 Special Edition: "No Regrets" Part One (Liner notes). Kodansha Comics. ^ ＤＶＤ付き　進撃の巨人（１６）限定版 [Attack on Titan (16) Limited Edition with DVD]. Kodansha. Retrieved April 19, 2016. ^ "Attack on Titan 19 Special Edition w/DVD". Penguin Random House. Retrieved April 19, 2016. ^ Hajime Isayama (2016). Attack on Titan Vol.19 Special Edition: "No Regrets" Part Two (Liner notes). Kodansha Comics. ^ "Top-Selling Manga in Japan by Volume: 2014". Anime News Network. January 2, 2015. Retrieved March 11, 2016. ^ "Best Sellers – Manga". The New York Times. April 19, 2015. Retrieved March 11, 2016. ^ "Best Sellers – Manga". The New York Times. February 8, 2015. Retrieved March 11, 2016. ^ O’Neil, Kate (June 17, 2014). "Attack On Titan: No Regrets Vol. #01 Manga Review". The Fandom Post. Retrieved March 11, 2016. This page was last edited on 26 February 2019, at 09:29 (UTC).